Trying to plan your perfect marriage proposal? Not sure where to begin or how to bring all your ideas together? You’ve made it here which shows you want your engagement to be creative and memorable. With The Yes Girls™ (the world’s first proposal planners), not only will you totally surprise your future fiancée, your marriage proposal will go beyond her wildest dreams! We will alleviate any stress because it doesn’t have to be difficult to be thoughtful! No matter your location, The Yes Girls can help! We produce luxury and custom marriage proposals. Let’s get started on your personalized marriage proposal idea below. With Package #1, you’ll receive 2 personalized proposal ideas invented just for you, NOT from a stock list of ideas. Why is this package awesome? Whether you have the basics of an idea or have no clue, this is the perfect place to start! Not only will your future fiance be surprised but forever in love with your unique engagement story! Chances are you’ve planned a better date than “candles and rose petals” so let’s ditch cliché and get personal. To put your best foot forward, a 30 min consultation with an experienced TYG proposal expert is included to review your custom proposal ideas and questions! You fill out our relationship questionnaire (breathe easy… questions aren’t intrusive). Link to questionnaire available immediately upon purchase. From your answers, The Yes Girls create two or more personalized marriage proposal ideas. We email you custom proposal ideas & visual aids within (4) business days of questionnaire submission. Talk to an expert! Enjoy a 30 minute phone consultation with a TYG proposal expert to review your ideas, logistics, questions and discuss best next steps. Whether that’s you planning the proposal idea from here or upgrading to our Package #3 so TYG can take of all the planning and coordination from here. Please note Package 1 does not include booking vendors and set up. Bonus Gift: Our “Top 10 Favorite Marriage Proposal Ideas of the Month”. Do you already have a specific marriage proposal idea in mind, but don’t have the time and/or resources to plan it? The Yes Girls™, a team of experienced proposal planners, will take care of all the planning to put you at ease. Whether you dislike planning details or just don’t have the time, this package is designed to assist you. You have the vision but The Yes Girls have the expertise and resources. We oversee all final arrangements and costs for smooth day of experience. Proposal planner personally available to discuss proposal details and questions. Step 1: Share your idea. We plan it! We put together your package and quote based off your proposal idea. We believe in being up front about everything so vendor costs will be itemized separate from our planning fee. Step 2: We coordinate. You propose! This is our most popular package. This proposal experience includes custom proposal ideas + our full planning services to keep the surprise while creating her perfect and romantic marriage proposal story! Assist you in a stress-free execution. Within the US and abroad, we have planned over 3000 custom marriage proposals so no matter your proposal location, her dream proposal can be her reality! We email you custom proposal ideas and pair images so you can visual the ideas. Once you choose the idea you love, we put together quote to review together so you are totally in the know. Create a detailed timeline so everyone is on the same page. Step 1: We help create an impressive idea! Ensure the chosen marriage proposal idea is customized to suit client’s budget (itemized in the quote). Talk to an expert! Enjoy a 30 minute phone consultation with a TYG proposal planner to review your quote, idea logistics, questions and discuss best next steps. Step 2: We plan and book it! Step 3: We coordinate. You propose! Custom Rate. Limited Dates Available. Our Very Impressional Proposal package is our full luxury proposal planning experience with her custom dream proposal as your grand finale. You receive all the perks. Please inquire with The Yes Girls directly for qualifications to reserve your proposal date and experience. Our clients pop the question all over the US and abroad! 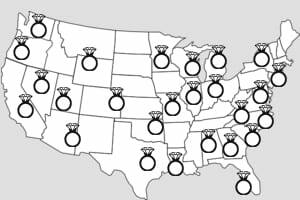 Looking for a specifc city to propose? The Yes Girls™ donates 10% of all profits to Water.org to provide clean water to families in need and 3 Strands Non-Profit to provide rescue and combat human trafficking through sustainable employment and education. Men, you only to get one chance to make a thoughtful and romantic marriage proposal perfect for your gal. There is no need to use other men’s generic marriage proposal ideas that you’ll find searching the internet. Your thoughtful effort towards creating her dream wedding proposal will speak for itself when you watch her share the story from when she said “yes!” As the original proposal planners, we’ve assisted with over 3000 unique and romantic marriage proposals. For an extra dose of assurance, you can read our clients’ success stories. We are so excited to help you plan a surprise marriage proposal that fits her style and your comfort zone! Not sure where to start? When in doubt, Package #1 is the perfect place to start!